Obviously, everyone is talking about Jimmie Johnson. His detractors are talking about the multi-car wreck he may or may not have triggered in what ultimately set up the win. His fans are just happy he won, even if it is a non-points event, because, well, it’s been a while. Did Johnson cause the crash? He didn’t help not cause it. It wasn’t intentional, but Johnson, whose kryptonite has always been superspeedway racing, admittedly wasn’t giving Paul Menard any room, and when Menard admittedly came down just a fraction, that was all, she wrote. It wasn’t pretty, but it was the product of the way superspeedway racing is in recent years. Another driver who deserves some talk this week is the one making his last start next Sunday. Jamie McMurray didn’t make a lot of noise in the Clash, finishing 11th after some damage in the crash, but he’s spent his career as an underrated speedway racer. Really, McMurray is almost Johnson’s opposite. While he has a few wins at other tracks, the big tracks at Daytona and Talladega are where he was always a threat throughout his career. His insight as a commentator as he moves on to his next chapter will be especially. valuable at those tracks. There was some single-file racing on Sunday, but that’s not necessarily a bad thing. First of all, unless you cut a race to about 10 laps, nobody is going to go hell-bent-for-leather the entire time. If they did, especially at Daytona, the race could quite possibly come down to which car, held together by duct tape and chewing gum, could limp to the end, or which backmarker could avoid the mayhem. While it would be great, in theory, to see drivers going for it every lap, it’s not realistic, even in an exhibition race. There’s a racer’s adage that says to finish first, first, you must finish. Taking too many risks too early isn’t smart racing when the race is well over a hundred miles long and points races are considerably longer. Does that make a race boring? It shouldn’t. Polesitter Menard, who’s drawn the pole three times in the five Clashes he’s been in, probably should have won, but his luck ended with his pole draw. He led twice for 51 of the 59 laps completed but was involved in triggering the late melee with Johnson, and as a result, wound up an unlucky 13th. Reigning Cup champ and defending Clash winner Joey Logano officially kicks off his title defense next week, but had a great warmup, finishing third. Kevin Harvick and Danny Hamlin, who lead active drivers with three wins apiece in this race, finished 12th and 17th, respectively. The organizations with the most wins in this event are Richard Childress Racing and Joe Gibbs Racing, with eight apiece. On Sunday, RCR’s Austin Dillon finished sixth, while the JGR contingent brought home 14th (Kyle Busch), 15th (Martin Truex Jr.), 17th (Hamlin) and 20th (Erik Jones). As it often is at superspeedway races, it came when an incident that might have been a one-or two-car dustup and on a short track not even an incident sent eight members of the 20-car field spinning. That it only happened once might be more a product of the short length of the race than the drivers avoiding trouble. As is often the case, it wasn’t intentional, and while both Johnson and Menard admitted fault, it was hardly intentional, but the result was one that’s become all too familiar in recent years. It’s definitely a product of speedway racing, at least with the current rules. Will the new rules that debut at Talladega this spring make a difference by giving drivers better throttle response to avoid the breed of racing we’ve learned to associate with these tracks? That’s something everyone should be watching. The rain put the final red flag on this one, and it’s fair to say that if the weather hadn’t played a role, the outcome might very well have been different. But it’s hard to say that the complexion of the race wasn’t already changed with the wreck, because the best car on the day was eliminated, along with a few others who likely would have been players. 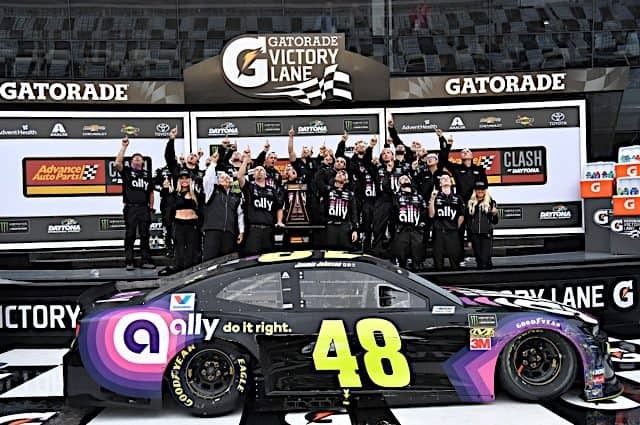 As if helping to cause a major wreck and winning in the rain didn’t create enough controversy for Johnson, another piece of the puzzle was whether he passed Kurt Busch by dropping below the double-yellow line that delineates the out-of-bounds areas at Daytona and Talladega. NASCAR didn’t think a rule was violated because at the point the No. 48’s wheels dropped under the line, he was trying to get out of the way of a sliding Menard. Avoiding a crash is an acceptable reason for crossing the yellow. That’s actually a bigger deal than the crash in the scheme of things because while crashes are an expected part of superspeedway racing, at least until a new package means they aren’t, inconsistent calls should not be. The problem is, NASCAR’s history of calling the yellow line has been sketchy at best. This call was clearly within the rules. But remember the summer Xfinity Series race last year? That seemed like a clear call, too, as Justin Haley had already nosed ahead of Elliott Sadler and Kyle Larson when his wheels dipped too low. But NASCAR decided Haley’s move was egregious enough to take away what would have been his first career win in that series. While the situation was different (Haley clearly wasn’t avoiding an incident), the call raises questions. The rule plays an important role in safety, but in all the years it’s been in play, NASCAR has never learned to call it consistently, and that makes the rule a bigger issue than it should be. Fans should care about how the sanctioning body enforces its rules, and consistency is the cornerstone of enforcing them fairly. How… come the Clash was run on Sunday? This race has been traditionally run on the Saturday night before Daytona 500 qualifying Sunday. Moving it to Sunday doesn’t really make a lot of sense. It does make Saturday’s ARCA race the final on-track event of the day, and there are no worries if that race were to produce a very long red flag. But does that outweigh the one glaring item that this change sets up: it makes the race essentially an extra Daytona 500 practice session for the teams who need it the least. Keeping the race at night kept the advantage to a minimum, but does holding it at the same time as the 500 change that? Well, yeah. With no points on the line, drivers can push their cars as hard as they want, with the only consequence the possibility of a crumpled car (or 10) and no trophy for their efforts. That’s not an opportunity the smaller teams have in practice, without unlimited backup cars at their disposal. The Clash is a fun race, but it should stay on Saturday night. “Some” single car racing ! That’s almost all this race was about. A few tried that bottom line but all they did was slide backward. This was a follow the leader single file sleeper. And the 500 will be just the same, and boring. With respect to the Clash being an extra practice session, pointless, a waste of time, too few cars to put on a good race, etc. etc., maybe they should open it up to any team that has an extra car that they don’t mind sacrificing for the extra practice. They can still call it the clash, they can still award a trophy, they would just acknowledge that it’s only purpose it a dry run for the 500.